The first family-friendly ornamental pepper with exceptional garden performance. 'Chilly Chili," as the name implies, has non-pungent fruit. The "heat" was bred out of the peppers, which is perfect for households with children who like to explore their environment. The fruit changes color from yellow to orange and matures at red. 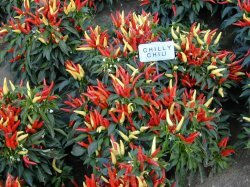 Extremely heat tolerant, 'Chilly Chili" will provide garden color during southern summers. Pepper plants can grow about a foot tall and spread 6-10 inches. The petite 2 inch peppers can be used as clever ornamental garnishes on salads or with ethnic entrees.